Max Landrak’s first children’s book is a delight. A fanciful tale of a boy who unexpectedly dreams of ‘not-blue’ in a world that consists only of blue, it functions equally well on both of its levels: as a metaphor for creative bravery and rewarding openness to difference; and as a coherent, concrete tale of imaginative adventure. The charmingly clumsy-faced characters are ‘discombobulated’ and utterly disgruntled by the idea of anything other than the world they know, but Danny determinedly sets out to communicate his vision. 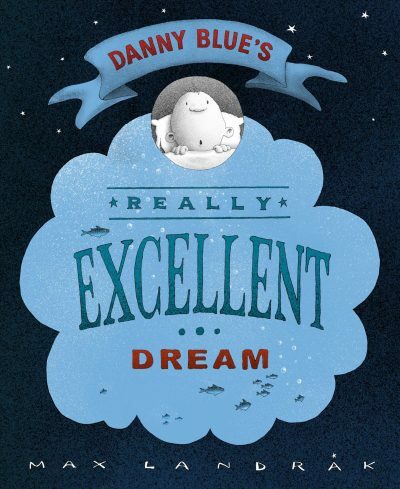 On one of the most eloquent pages, Danny tries to tell his father (the most celebrated paint-maker in all of Blue York) about his dream, but can only manage an empty speech bubble: it isn’t only ‘not-blue’ colours that are absent in his world, but language to comprehend them. The powerful image signifies the gap between familiarity and creativity. But the underlying messages never feel weighed down by earnestness. The narrative voice remains light, friendly, almost conspiratorial in its recounting of this wondrous event; and annotations to the images bring humour for readers of various ages (in the paint factory’s basement, ingredient labels include ‘They stopped making this for a reason’, while Danny’s failed colour ‘stinky blue’ is bound to bring forth giggles).